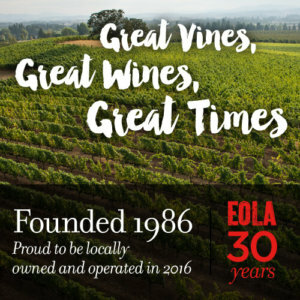 EOLA HILLS CELEBRATE 30 YEARS OF GREAT VINES, GREAT WINES, AND GREAT TIMES! 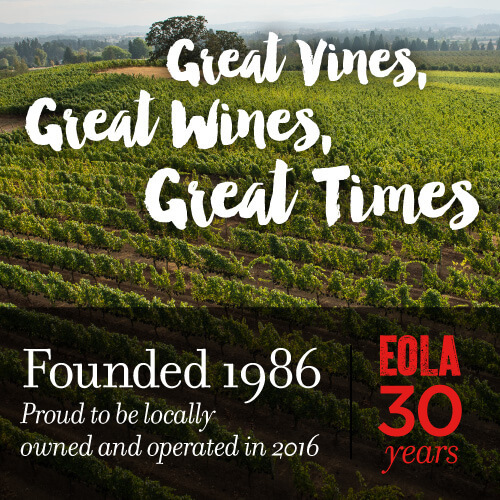 Join us on Saturday, November 5th 2016 to help Eola Hills Wine Cellars celebrate 30 years of great wines and great times! We invite our friends to enjoy complimentary wine tasting, live music, and local culinary bites at all three locations – Rickreall, McMinnville and newest property Legacy Estate Vineyard. All locations will be offering specials on our wines. Stay tuned for all the festivities we will announcing including upcoming events like the 2017 Great American Eclipse! Ask about us about overnight packages and winemaker dinner. For more details, visit our website at www.eolahillswinery.com or call 503-623-2405. Three Locations to visit: Open from 10 am – 6 pm, complimentary tasting, food options available, special 30th Anniversary passport to participate for eligible prizes. Enjoy winemaker Steve Anderson’s award-winning wines, from estate-grown Pinot Noir to Lodi Zinfandel. At our newest vineyard just ten minutes from Salem, you’ll enjoy Eola Hills Wine Cellars’ finest wines – and beautiful valley and vineyard views. Bring your walking shoes for a stroll through the vineyard rows, and binoculars to look for native birds including hawks and wild turkeys. Or, enjoy on the spacious lawns bordering Legacy Lake. You’ll find us in the heart of historic, downtown McMinnville. Enjoy the ambiance of an antique-filled tasting room and winemaker Steve Anderson’s award-winning and reserve wines.